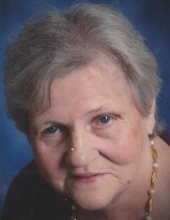 Betty Jo Herald, 83, passed away Friday, January 18, 2019 in Georgetown. She was born in Sadieville, Kentucky on April 4, 1935 to the late Joseph and Geneva Wright Barron. Betty was a graduate of Oxford High School, retired from Georgetown Cable, and a member of Grace Baptist Church, where she loved going to church. She is survived by son, Troy Herald of Paris, Kentucky and daughter, Kim McDonald of Georgetown, Kentucky, grandchildren, Doug McDonald, Evan McDonald, Sierra McMillin, Melissa Berry, great grandchildren, Clarke McDonald, Sutton McDonald, Bennett McDonald, Jacob Berry, and Jackson Berry. She is also survived by brother, Scott Barron of Sadieville, Kentucky. Betty was preceded in death by sisters and brothers, Louise Barron, Mary Alice Mullikin, Burford Barron, and Oscar Barron. Visitation for Betty will be Monday, January 21, 2019 from 5pm to 9pm at Tucker, Yocum, & Wilson Funeral Home. Service will be 11am Tuesday, January 22, 2019 at the funeral home with Minister William Van Nunen officiating. Burial will follow the service at Georgetown Cemetery. To send flowers or a remembrance gift to the family of Betty Jo Herald, please visit our Tribute Store. "Email Address" would like to share the life celebration of Betty Jo Herald. Click on the "link" to go to share a favorite memory or leave a condolence message for the family.